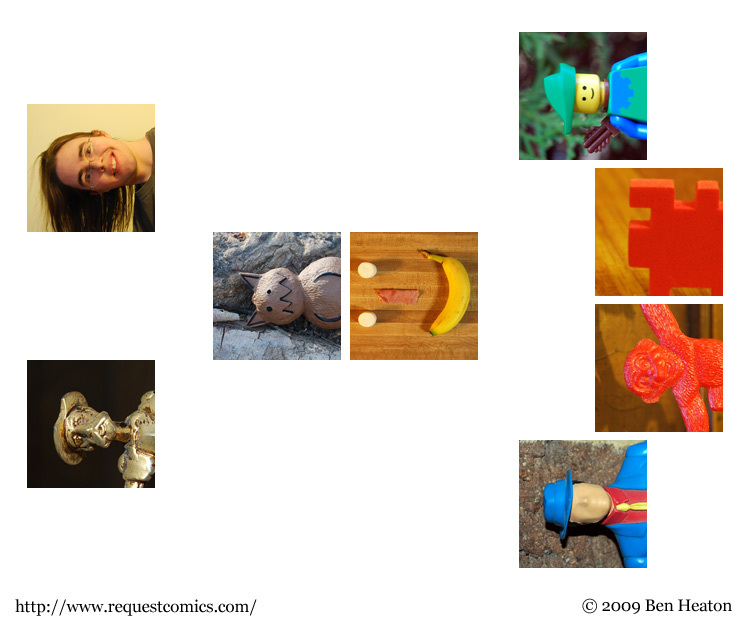 Can you figure out the earliest strip each of these characters appears in? It's a trick question. I don't believe that that banana has been in any strips so far. Apart from this one. There's been a banana. In the raisins strip. You know, you could have just taken an ordinary picture and rotated it, and you would be safe from gravity's annoying hair-pulling features! That wouldn't be in the spirit of the emoticon. Maybe if Chenjesu had done one of those ^_^ ones, but he's not really the type to do that. The raisins strip was made in 2008, so unless the banana has been preserved somehow for at least two months, it isn't the same one. The mind games! The horror! The food from that picture has appeared in another strip. It was a sneak preview! Of course! I don't recognize the guy in blue on the lower-right. He looks kind of like the guy that was in the chess tournament one.